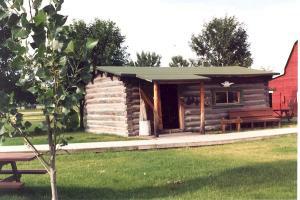 The LaForge cabin was built in Lodge Grass, Montana by Thomas LaForge and his eldest son, Tom. The logs were cut in the Wolf Mountains, which are located just east of Lodge Grass. The cabin features only those items necessary to make it a home. Thomas LaForge, whose ancestors were French Huguenots from South Carolina, was born in Ohio in 1850. He came to Montana with his parents in 1865. At the age of 19 he had decided to live among the Crow Indians. Later he was adopted by the tribe and became a scout for military campaigns led by notable leaders including Custer, Terry and Gibbons. He missed being called as a scout in the Battle of the Little Bighorn due to an injury. The cabin was occupied by three generations of the LaForge Family and moved to the Museum site in 1981. 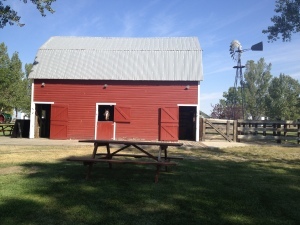 The barn was built in 1926 on this site. The acreage the museum now encompasses was once a truck farm. Vegetables were grown and sold to local grocery stores and residents. The exhibits in the barn consist of a variety of horse tack and hand tools used during that era. Attached to the barn on the north is a blacksmith shop filled with a vast variety of tools used to keep farm machinery in good operating condition at Campbell Farming Corporation.